I sat at the table and opened my daughter’s Bible. I took a piece of tape and gently placed it around the edges of the tab that marked Psalms. We got the tabs five years ago so she could easily find each book, and now there were tiny tears along the sides of them, threatening to rip the thin pages. I sat there for about an hour, slowly turning the tabs, taping the tears, touched by the highlights and notes my daughter has recorded over the years. It made me reflect on how much my own life has been impacted by the power of these words too. There was the time in college when I was struggling with my self-image and food, constantly consumed by worry and obsession…and I read Matthew 6:25-34 for the first time. Therefore I tell you, do not worry about your life, what you will eat or what you will drink, or about your body, what you will wear. Is not life more than food and the body more than clothing? Look at the birds of the air; they neither sow nor reap nor gather into barns, and yet our heavenly Father feeds them. Are you not of more value than they?… But strive first for the kingdom of God and his righteousness, and all these things will be given to you as well. There was the time when my kids were younger and my husband was traveling a lot and the stress caused insomnia to creep into my nights…and Psalm 4:8 gave me comfort and rest. I will both lie down and sleep in peace; for you alone, O Lord, make me lie down in safety. There was the time I was dealing with feelings I had stuffed away for years, scared to dig them up…and Isaiah 43:1-2 gave me courage. There were times of sadness too–at the death of a friend and my cousin–and John 3:16 gave me incredible peace. So many words with so much power. Without them, I never would have gotten to a place of dreaming God-sized dreams. I remember the first pull on my heart toward those dreams, when I wondered how it would all work out…and I read Proverbs 16:3. And the times along my journey when those plans seemed out of reach or impossible…and Isaiah 40:31 reminded me to press on. …but those who hope in the LORD will renew their strength. They will soar on wings like eagles; they will run and not grow weary, they will walk and not be faint. I remember when I first spoke to a large audience and was sure I wouldn’t have the right words…and I happened upon Exodus 4:11. Now go, and I will be with your mouth and teach you what you are to speak. And even now, at this place where dreams set sail, I am continually filled and guided by His voice. The words in these pages–they have the power to change, to comfort, and to challenge. As I held my daughter’s Bible that day, you know what struck me? Just how lovingly God has been holding me, my entire life. He’s holding you too, sweet friend. Do you realize that? He’s got you–and your dreams–in His hands. You don’t have to wonder and worry (and figure it all out on your own). No matter where you are on your path of following that tug on your heart or finding your calling, you can take the next step knowing you have a map to help you navigate the journey. See, it’s not just a book, this Bible. It’s not just sentences and words. If you’ve ever wanted anything, dreamed of anything, doubted anything, struggled with anything, feared anything, worried about anything, felt lonely, anxious, sad, expectant, eager, you name it…open the pages. What about you? What verses have impacted your life and your dreams over the years? 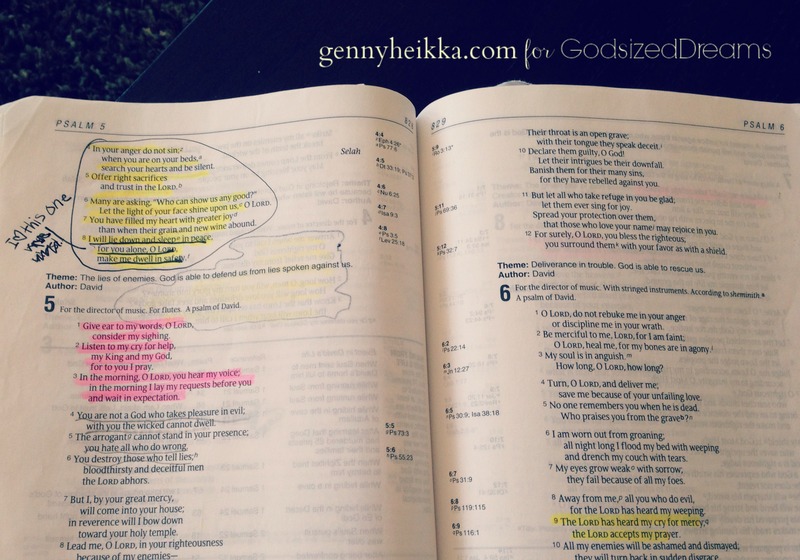 Have you been letting His words soak into your soul and guide you as you navigate your journey? Take time today to read. He has all the answers we need; sometimes we just need to take that next step to listen and hear. Thank you for stopping by and reading, Ashley! Thanks, Kristin. Turning those pages just totally struck me and reminded me how much my life has been impacted by His words! I followed a link form Linda McClellan on G+ to your blog. What beautiful images you have. You have a great writing style too.